Unlimited wings, churros, pasta, beer, and more! (SPOT.ph) It’s time to celebrate once again because it's finally payday weekend! We found some amazing food deals this week, including unlimited wings, churros, pasta, and beer. 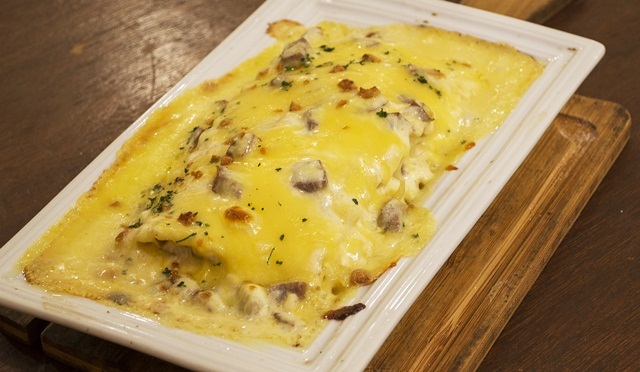 You definitely deserve more than just a pat on the back for surviving another work week. Which food goes best with beer? Crispy Pata! 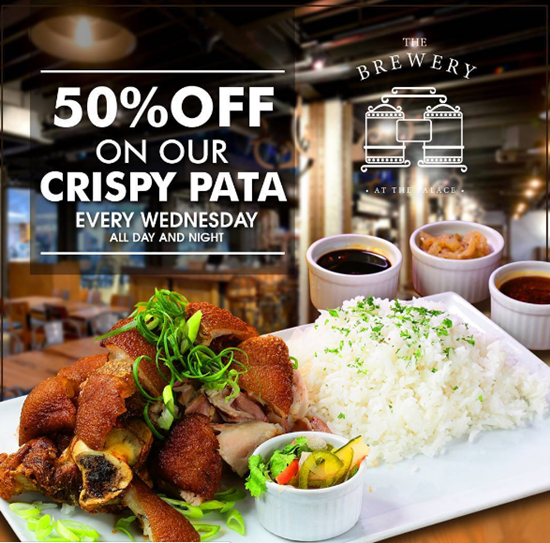 Score The Brewery’s Crispy Patas for 50% off every Wednesday. The Brewery is at 10th Avenue corner 38th Street, Uptown Parade, Bonifacio Global City. National Wing Day isn’t over yet at Crazy Chick! 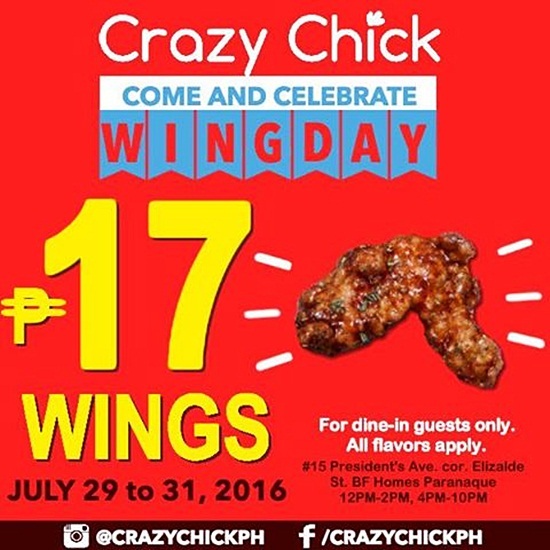 You can still score their P17 wings until tomorrow, July 31. Bring your friends for the ultimate chicken wings feast! 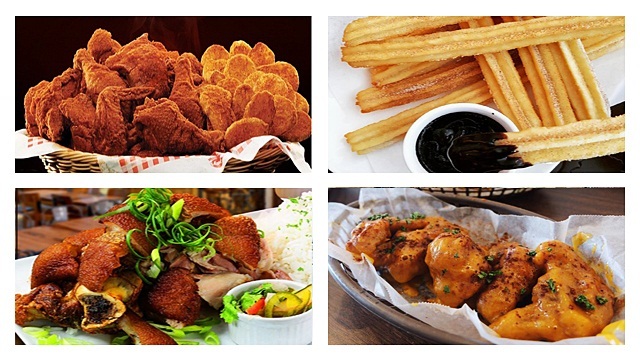 Crazy Chick is at 15 President's Avenue corner Elizalde Street, BF Homes, Parañaque City. Good ‘ol Buffalo Bro’s Ribs and Wings extended their All-You-Can Wings promo until tomorrow, July 31, so you still have time to grab this deal! 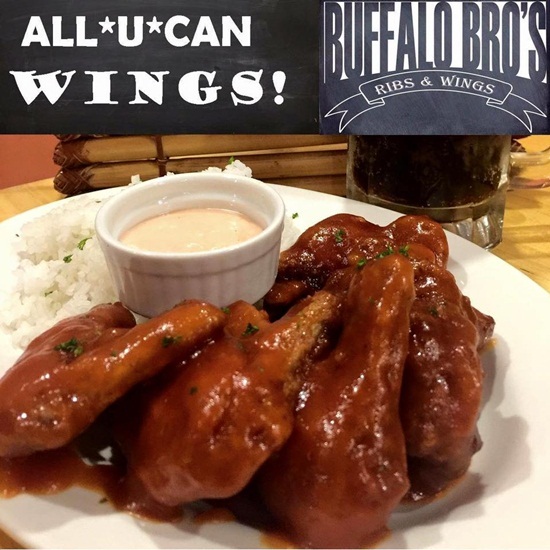 Promo also includes unlimited rice and a single serve of root beer float, and is only valid for dine-in transactions from 11 a.m. to 3 p.m. and 5 p.m. to 9 p.m.
Buffalo Bro’s Ribs and Wings is at 45-B Maginhawa Street, UP Village, Diliman, Quezon City. Craving churros? 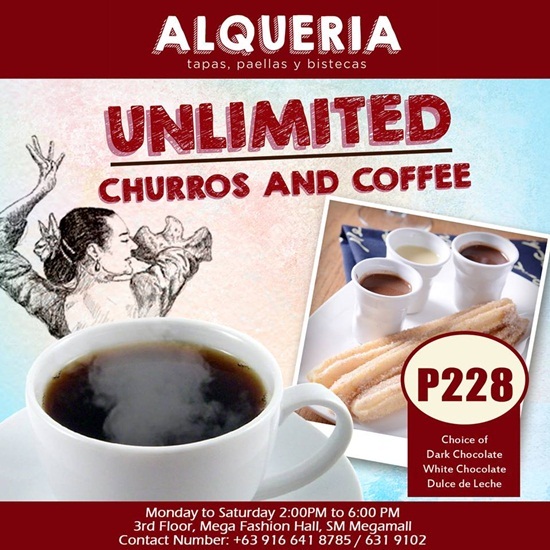 Head over to Alqueria and avail of their unlimited churros and coffee for only P228. Call up all you tita friends! Alqueria is at 3/F Mega Fashion Hall, SM Megamall, Ortigas, Mandaluyong City. Krispy Kreme celebrated their 79th birthday on July 13, but they’re not quite done with the birthday treat yet! 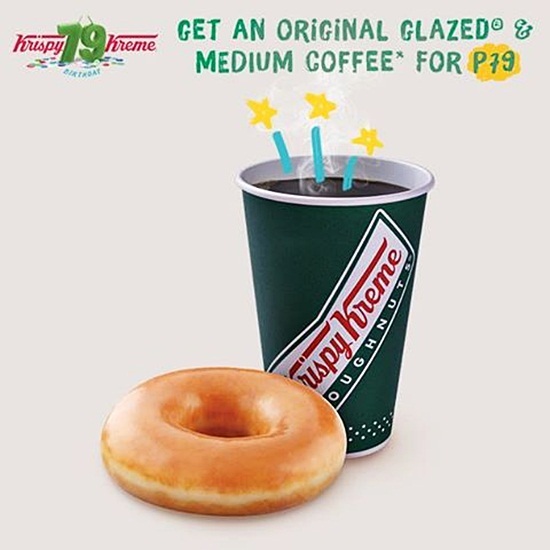 Get one medium hot or iced Americano or Cappuccino and one Original Glazed doughnut for only P79 until tomorrow, July 31. Isn’t that sweet? See here for a list of Krispy Kreme branches. Beer lovers, we found the perfect deal for you. 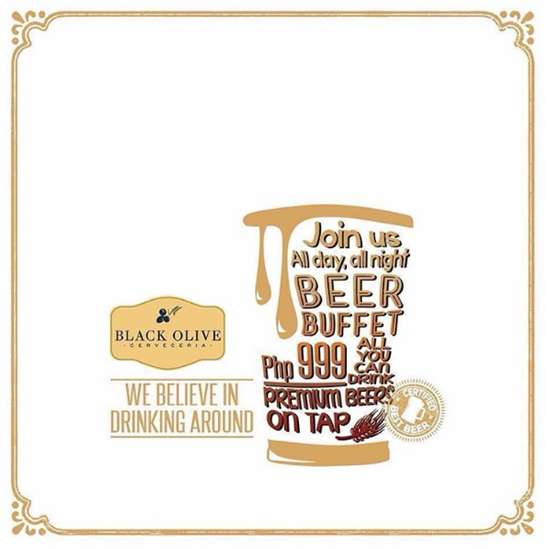 For three hours, chug down all the premium beers on tap that you can for only P999 at Black Olive! Try something fruity, citrusy, dark, or caramelized. But please do remember to drink responsibly. Black Olive is at Capitol Commons, Camino Verde Road, Pasig City. 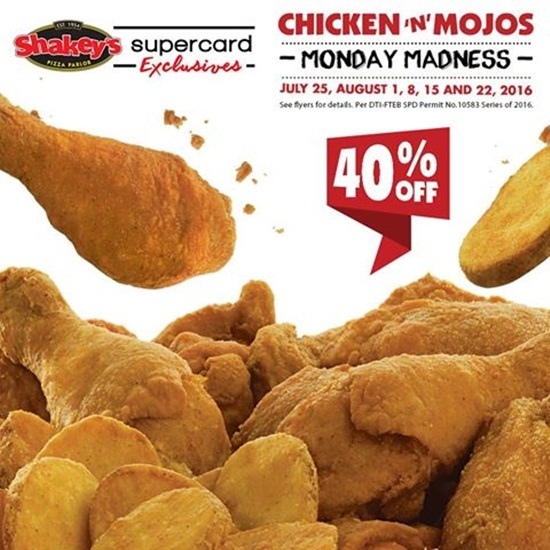 Shakey’s is back with their Chicken ‘N’ Mojos Mondays! Every Monday until August 22, enjoy 40% off when you order a pack of chicken and mojos. Promo is exclusive to Shakey’s SuperCard holders, and is valid for dine-in transactions only in all Shakey’s outlets nationwide. See here for a list of Shakey’s branches. 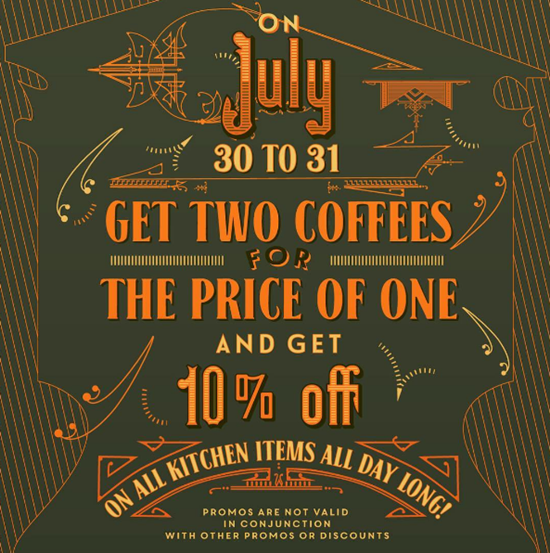 In case you find yourselves at Shangri-La at The Fort this weekend, drop by Toby’s Estate and get two coffees for the price of one! If that isn’t sweet enough, you can also get their kitchen items for 10% off! Promo is valid only at the Shangri-La branch until tomorrow, July 31. 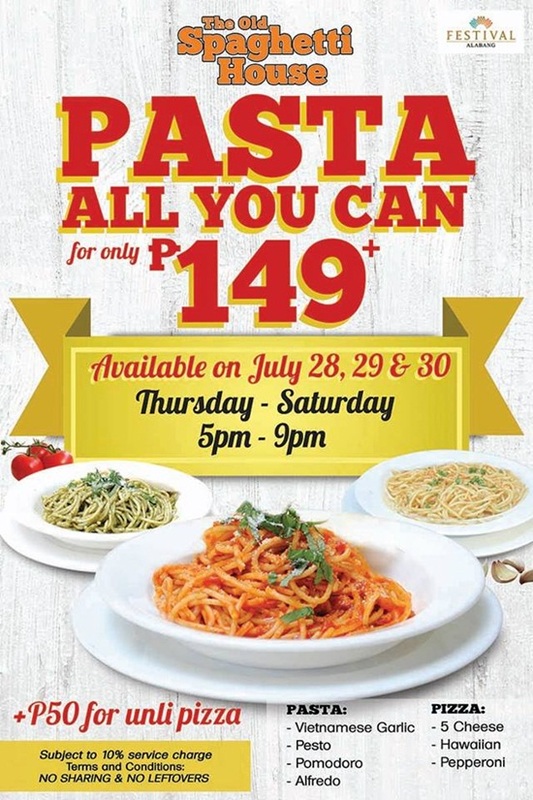 Today, July 30, treat yourself to pasta-all-you-can at The Old Spaghetti House in Festival Mall Alabang! 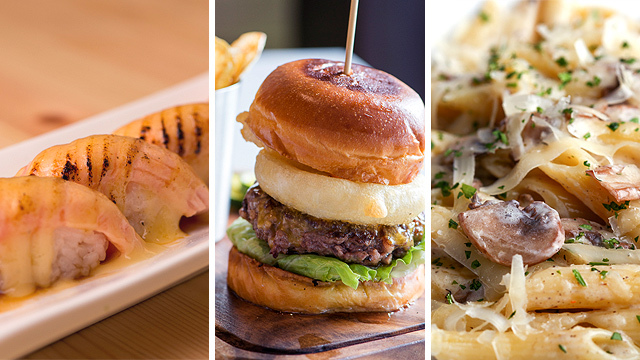 Choose from Vietnamese Garlic, Pesto, Pomodoro, or Alfredo pasta for your meal. 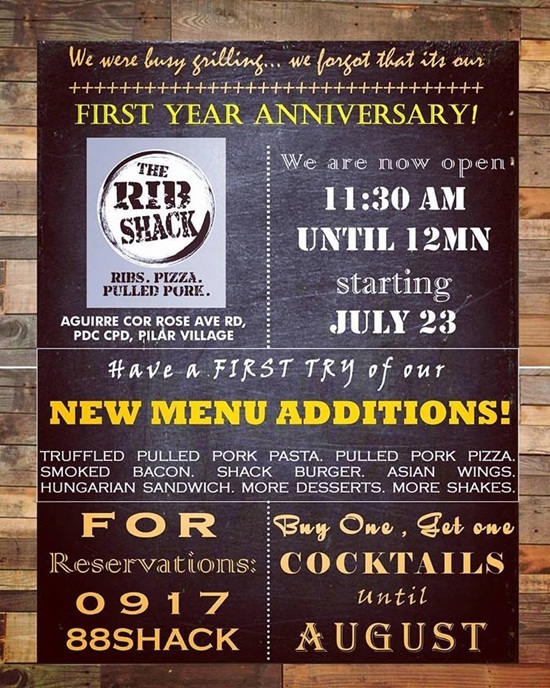 Promo is valid only at the Alabang branch from 5 p.m. to 9 p.m.
It’s The Rib Shack’s first anniversary, and aside from adding new items on their menu, they’ll also be offering buy-one-get-one cocktails until August! See here for a list of The Rib Shack branches. Photos courtesy of The Brewery, Crazy Chick, Buffalo Bro's Ribs and Wings, Alqueria, Krispy Kreme, Black Olive, Shakey's, Toby's Estate, The Old Spaghetti House, and The Rib Shack.